Monolog’s mission is simple: bring great coffee to this great, coffee-growing nation. Proud to be local, 100% of Monolog’s coffee is from Indonesia, and it is roasted, blended and ground on their own premises. We brunched there to see whether this Indonesian brand can compete with the cafes of Melbourne, Europe and Seattle. Fans of Plaza Senayan and residents of the surrounding area will surely be familiar with the black-and-white signage of Monolog Quality Coffee Co., which has been open in the mall for over four years. Loyal customers know it’s a great place to grab a pick-me-up on the way to or from the office. At the newer Pondok Indah location (open for around two years), the outdoor terrace is a good spot to sit and nurse a couple (or three or four) cappuccinos and laze over the weekend papers. We visited the Pondok Indah branch on a bustling weekday, at prime brunching hour. The first order of business at any brunch is to make pretences at being healthy before devouring some devilish concoction of eggs and syrup and pastry and all things bad for you. Hence, I ordered the ‘Green Detox’ juice: a refreshing blend of spinach, green apple, and lemon. It was pleasantly, moderately sweet, but still felt like it was doing my insides some good. Conscience—and tastebuds—satisfied, I moved on to deliberating over the main event. Monolog’s menu at Pondok Indah has slightly more choice than their Senayan location. It covers a lot of bases. We’ll get to the all-day breakfast in a minute, but in addition to this, there are also all-day favourites, snacks, sandwiches, salads, soups, burgers and pancake/crepes on offer, as well as a tight edit of Asian favourites (naturally). All the pastries, cakes and breads are home-baked, and in Pondok Indah, they can whip up cocktails of a quality to match any of Jakarta’s mixologists. It’s a comprehensive offering, so whether you love their breakfast, their baking, or their booze – they’ve got you covered. Since it was 11am (and I usually refrain from drinking until at least 11.59) I went the breakfast route. I love eggs benedict, and I hear that’s a very popular choice. There is bircher muesli for something lighter, and you can of course get the full monty with eggs, (beef) brockwurst and ham, mushrooms and toast in their Sunrise Breakfast Set. I chose a nice middle ground, and the Monolog Croque Madame didn’t disappoint. It was somewhere between an American grilled cheese sandwich and the traditional French madame. The baguette was softened nicely on the grill and topped with a homemade basil pesto and a fried egg. Inside nestled layers of cheese, turkey ham, mushrooms and tomatoes. It struck that perfect balance between breakfast and lunch, being a satisfying meal yet still leaving me with enough room to sample an almond croissant afterwards with my cappuccino. 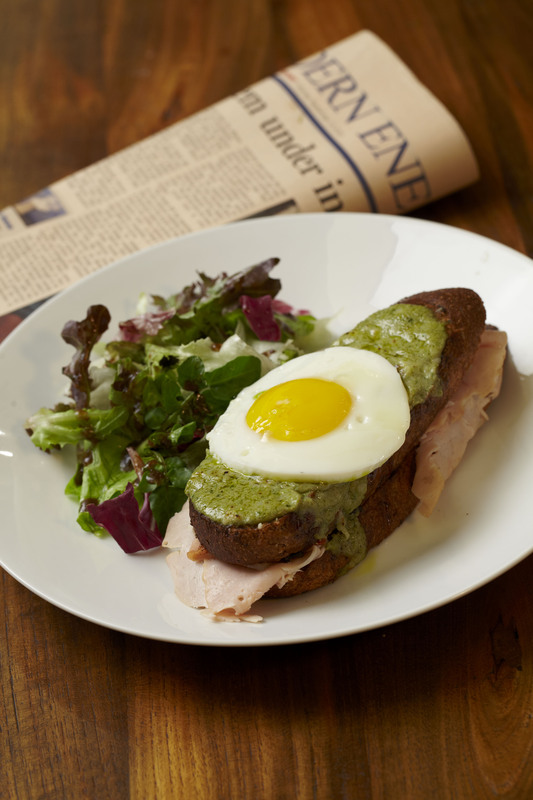 My companion tried the Monte Cristo French Toast, a slightly more unusual savoury turkey ham and cheese French toast sandwich served with a strawberry field salad – and she was very happy indeed with it. We finished up our mains and looked forward to our coffee and pastries. Monolog will not entertain your requests for a ‘tall’, ‘grande’ or even ‘venti-venti-supersize’ beverage (seriously though, where are you actually putting that volume of liquid anyway?). They will not heed your pleas of ‘please sir, extra hot!’ You will be served your coffee the way you should be served it: the right way. There is, in fact, a science to it. There is a correct proportion of water-to-coffee that makes that perfect inky espresso, and a correct ratio of coffee-to-milk to make each type of drink, from flat white to long black and everything in between. All these measures ensure that your coffee is well-balanced, and not burned by overheating. Only then can you really taste the flavour of the beans as the grower intended. The one concession they will allow is soy milk for those who are intolerant. If you’re used to a bog-standard latte from a certain Seattle chain, I urge you to try a proper cappuccino here – it will convert you with its silky robustness. My almond croissant was flaky and fluffy and all the more yummy for a-dunking in the cappuccino. My friend tried one of their newest innovations, a Red Velvet Donut, which was a huge, sugary crowd-pleaser. 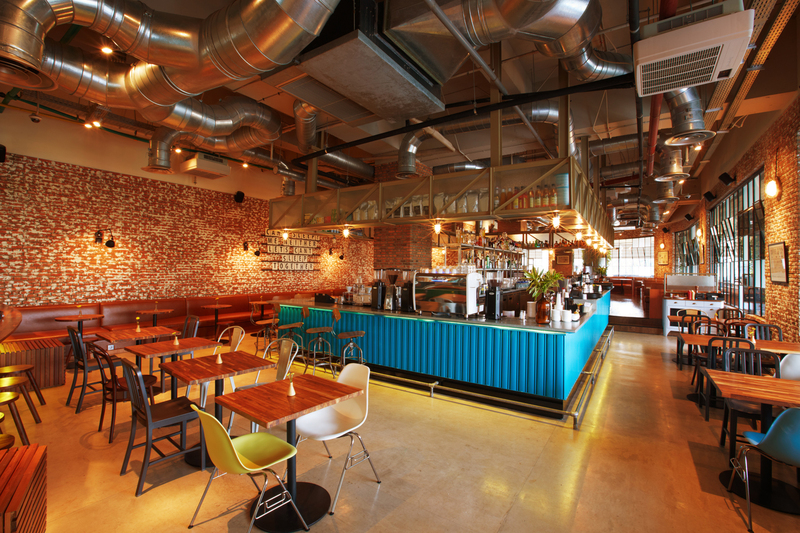 Monolog Pondok Indah has a funky, industrial-chic, urban feel to the decor, which is comfy enough for lounging around, but still with a buzzy vibe for when things heat up later on. They’re open late at weekends, with a chilled DJ on Saturdays and live music on Wednesdays. It’s pleasing to see more and more establishments in Jakarta offering the type of coffee you would expect to find in the laneways of Melbourne or the piazzas of Italy (different though those styles are). 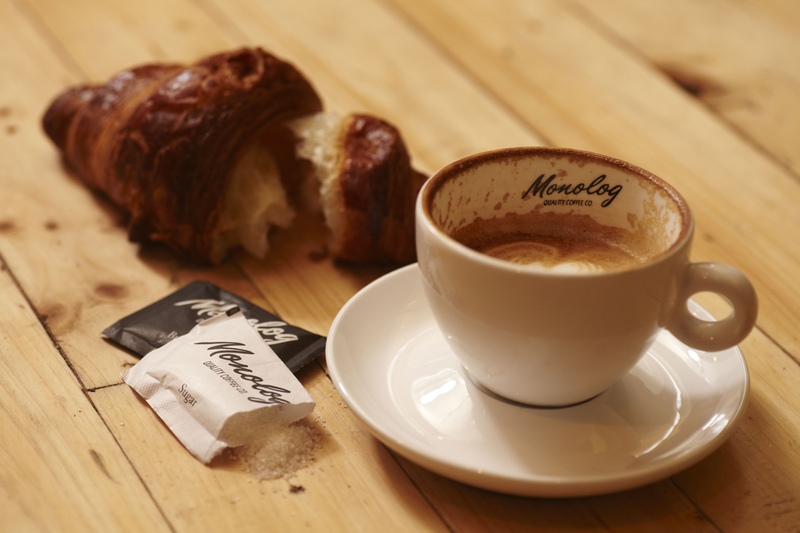 Monolog was one of the first to start this trend, and proper coffee is certainly what they do best. So go and get your caffeine on.